"The number of recalls is difficult to estimate now and there is the question of how many customers will replace batteries without any problems,'' said Tatsuya Mizuho, a director at the credit rating agency Fitch Ratings. The above quote is in reference to all of the computer manufacturers now recalling Sony batteries used in their laptops. You are a FOOL if you do not have your battery replaced. Does this have anything to do with fire? Not likely. Only about 0.5M batteries are actually affected even though Dell alone has recalled over 4.2M. The reason you'd be a fool is because Li-ion batteries degrade with each recharge. Every time you recharge a Li-ion battery it has less capacity than the time before. In other words, your battery is not nearly as good as it was the day you got it. In fact, because batteries slowly leak charge and are continuously recharged by your computer, it is likely your battery that held 4 hours of charge 2 years ago only holds bout 40min of charge now, even if you never ran it on battery alone. So if you have a manufacturer offering to replace your battery for free ... DO IT. 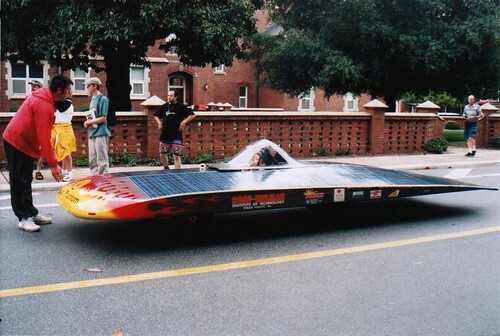 I used to be on a solar car racing team. It was fun. Now, I'm in grad school. I wonder if I will look back on this and say, "it was fun." My battery came from Apple in about a week and half, not the suggested 4-6 weeks. That was rather impressive. Though I can't say that I've never thrown up a smoke screen to give me a chance to do some quick work and end up looking like a super star, but, hey, it worked for me. I am loving the new battery. My laptop is almost three years old. The battery used to last for hours, but had seen enough cycles on it that it was starting to fade. It lasted for, at most, 45min if I was doing anything at all. With the new battery I am back up into the hours range again. It was kind of nice to watch the NFL season opener while I worked on school stuff (though it would have been better if I would have (1) cared about the teams, or (2) didn't have the school work). I watch the show Over Haulin' and I get scared because I think someone might try to put me and the Bee on the show. I have strategically placed the car's parts at my mom's house, my dad's house, my friend's house, and my house. This makes it very difficult to overhaul me since parts are in so many places; there would be no good way to steal the car from all 4 places at 1 time without it looking very suspect. If, however, someone were to find a way to Overhaul me they need to consider that I have specific things I want done in specific ways or I will be very very very unhappy. Other than that, I think I'd be open to it. The front end of a '70 Bee looks kind of funky and it would be interesting to see what someone like Chip Foose would do to try to make it look better.